TWSW was established in 2001 as The South West Public Transport Users’ Forum (SWPTUF) to promote the interests of public transport users in the South West of England. 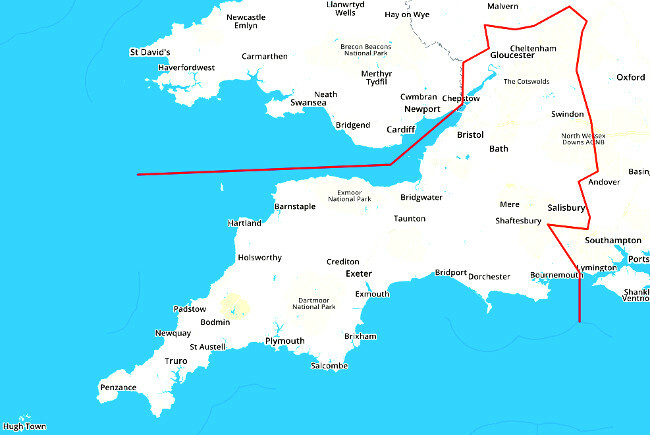 Our “South West” comprises the counties of Cornwall, Devon, Dorset, Gloucestershire, and Somerset and the unitary authorities of Bath and North East Somerset, Bournemouth, Bristol, North Somerset, Plymouth, Poole, South Gloucestershire, Swindon, Torbay and Wiltshire. Although our mandated interest is within the area shown, we are very happy to work with members across the border, since travel and transport is all about getting from one place to another! The Forum became a Community Interest Company, limited by guarantee, in August 2005. SWPTUF adopted the trading name of TravelWatch SouthWest in June 2006 and the Community Interest Company changed name to TravelWatch SouthWest CIC in November 2008. Membership of the TravelWatch SouthWest CIC is open to every ‘not-for-profit’ organisation in the South West of England whose sole or principal purpose is to represent the users of any public transport service or to promote the development of public transport services – membership is also open to other ‘not-for-profit’ organisations’ in the South West England who represent the interests of special and potential classes of public transport users e.g. the disabled or the elderly. TWSW currently has over one hundred affiliated organisations. TWSW, which is a social enterprise company, acts as an advocate for passengers to lobby for the improvement of public transport in the region and works closely with local authorities, business organisations, partnerships and other stakeholder groups – with the dissolution of the former Rail Passengers Committee for Western England in July 2005, TWSW is the representative body for public transport users throughout the South West of England. We hope you will read TravelWatch SouthWest’s response to the consultation on the South Western Franchise. This response was put together following two stakeholder events held by Travelwatch SouthWest in conjunction with DfT, and which saw active participation and input by representatives of Local Authorities, LEPs and our many affiliated user groups. The government has acknowledged, and seeks to improve, the contribution rail makes to the economy, the environment and social inclusion; it has outlined the key strengths of this safe and green mode of mass transit for moving people into and across conurbations, and between population centres and international gateways; and the government has laid out some clear objectives for rail. Our stakeholders particularly welcome the government’s aim of accommodating projected demand for rail, and the objective for rail to tackle capacity constraints, grow new markets and support wider housing and economic development plans. The last census showed that the country as a whole had seen unprecedented population growth over the previous decade. This growth has continued in the four years since, and is projected to grow further. Bristol and Bournemouth were in the top ten cities or large towns for population and jobs in the decade to 2013. The population profile for the franchise area as a whole shows a higher percentage of older people than the national average. While there are concentrations of younger people around our urban centres with their universities. Both these sections of the population have significant reliance on public transport. With local spatial and economic plans for growth indicating thousands of more dwellings and jobs, the role of rail as part of an enabling transport system supporting the movement of this growing population between their homes, work, learning, medical, and social places is crucial. The South Western Franchise has distinct characteristics. In terms of passenger and train numbers the London commuting part of the franchise skews any statistics regarding the franchise towards London. Our concern is that the rest of the franchise, with its longer distances, different passenger profiles, and less dense but growing population should have its needs and aspirations understood and rail’s potential for achieving the government’s aim for the mode fully explored. Geographically, this part of the franchise makes up about half of the franchise area, but being married to a successful partner can sometimes be overlooked for “promotion”. With London-based decision makers experiencing first-hand the issues affecting the eastern part of the franchise, TravelWatch South West want to ensure that how the people, Local Authorities and LEPS view their area and the potential for rail to make an increased contribution to the social, economic and environmental wellbeing of the rest of the franchise is understood. We commend to you “The Other Half”; TravelWatch South West’s response to the Rail Executive’s consultation on the South Western Franchise.